DermpathMD.com-Issues in Dermatopathology-Melanoma in situ or regressed melanoma? 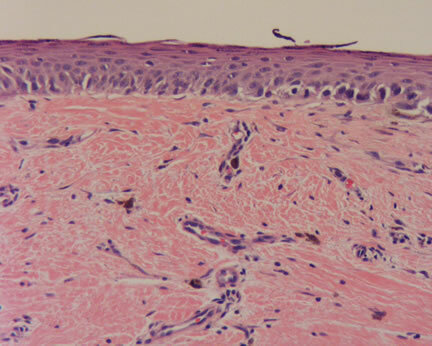 Image 1-Excision shows thinned epidermis with characteristic flattened rete ridge pattern, suggestive of regression. Note the large areas of fibroplasia and telangiectasia, histologic features of regression. Image 2-Higher power magnification shows the proliferation of cytologically atypical melanocytes arranged at the dermal-epidermal junction. Image 3-The junctional melanocytes show marked variability in size and shape and are arranged in expansile and dyscohesive nests. 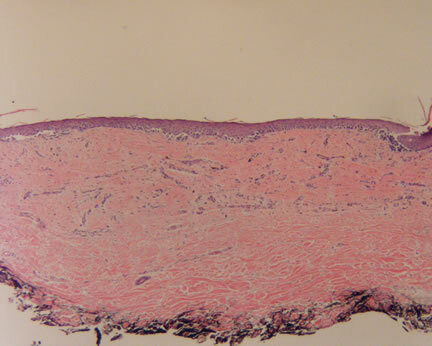 Image 4-Higher power magnification of the area of regression showing the characteristic fibroplasia, telangiectasia, and melanophages. Melanoma in situ or regressed melanoma? Completely regressed primary cutaneous malignant melanoma with nodal and/or visceral metastases: a report of 5 cases and assessment of the literature and diagnostic criteria. High WA, Stewart D, Wilbers CR, Cockerell CJ, Hoang MP, Fitzpatrick JE. Recently, I reviewed a case of an irregular pigmented lesion occurring on the chest of a 71 year old man. The dermatologist was concerned about the possibility of a melanoma and wisely did an excision. There was no prior history of treatment or prior biopsy at this site. On histopathologic examination, there were two predominant findings. At the dermal-epidermal junction, there was a proliferation of cytologically atypical melanocytes arranged in expansile and dyscohesive nests. These findings alone were diagnostic of a melanoma in situ. No dermal invasion by the melanocytes was noted. However, there was an additional histologic finding. The papillary dermis contained large areas of scarring with fibroplasia, telangiectasia, and melanophages. There was no history of a prior biopsy or treatment to this area. Thus, these histologic findings are diagnostic for regression. 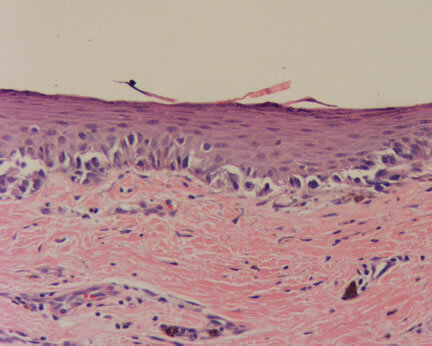 Regression is an interesting albeit controversial term in dermatopathology. One may conceptualize it as the body's immune response to the melanoma. In the earliest stages, a lichenoid inflammatory cell infiltrate will be present, effacing the dermal-epidermal junction. Such a tissue reaction is commonly seen in many conditions, notably a lichen planus-like keratosis (benign lichenoid keratosis). In this latter state, epidermal lesions such as a lentigo or seborrheic keratosis may undergo regression and eventual destruction by the body's immune cells. Regression may occur in benign melanocytic nevi as well as melanomas. A halo nevus is a classic example of this former condition. At times, a definitive diagnosis is difficult since much of the architecture and melanocytes may be obliterated due to the inflammation.. However, in some cases, such as this current case, there is a residual melanocytic proliferation which is architecturally and cytologically malignant. Although one may be tempted to diagnose this melanocytic lesion as a melanoma in situ, the presence of regression, directly underlying the junctional proliferation, overrides this interpretation. The reason is one cannot determine whether the melanoma had been invasive into the dermis and subsequently regressed back to the dermal-epidermal junction. 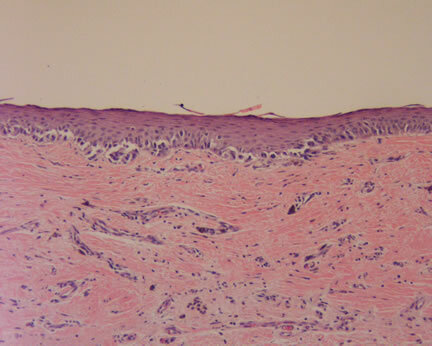 If this had occured, this melanoma is no longer a melanoma in situ but rather a melanoma with regression, limited to the dermal-epidermal junction. This distinction is critical since in the former situation, a complete excision is curative while in the latter, there is the potential for metastases. In these cases, I usually recommend a complete excision and suggest consideration for a sentinel lymph node evaluation, especially if there are clinically suspicious lymph nodes. The article cited above emphasizes the potentially sinister prognosis of regressed melanomas. Remember, a melanoma limited to the dermal-epidermal junction is not the same as a melanoma in situ in the presence of regression. When you have reviewed the case and discussion, please comment, I will post them anonymously.